There’s something about the game of basketball that elicits thoughts of the divine. The three point shot, the three-point play, the three-man weave, the triple double…you get the point. Tonight I’m watching the Atlanta Hawks live for the first time this season. Like most people who live in Atlanta, I haven’t been super “into” the Hawks; that is, until recently. I’ve heard a lot of buzz about the team this year, their unselfish play and beautiful style of basketball. So after lots of highlight reels, articles, and clips, I finally had to take in a game. And the hometown boys didn’t disappoint. After Wednesday night’s double-digit victory, the Hawks achieved something of a rarity.They’ve gone on to win 19 straight games [the streak ended Feb 2] and 31 of 33 since Thanksgiving. They have not only been winning, they’ve been destroying opposing teams. But destroying them in such a graceful way that you almost imagine the opposing team thinking, “it was an honor to get our teeth kicked in by those guys”. So how have they done this? 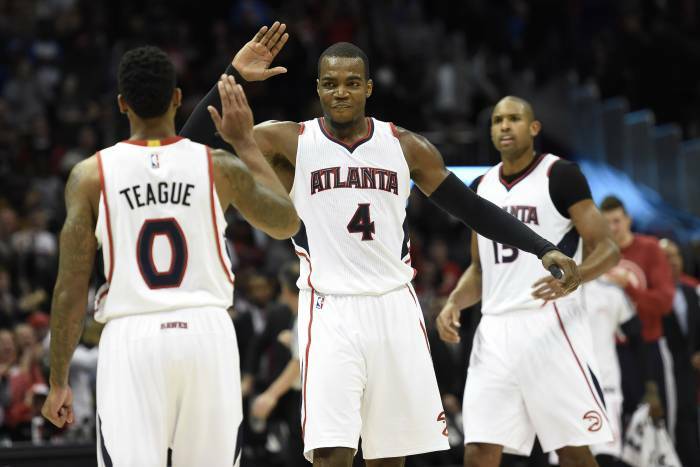 The Hawks have no superstars, and no players among the league’s top 30 leading scorers. Yet all 5 starters average double figures. They assist on more baskets than any other team. On offense, passes find their recipient like a Forrest Gump ping pong ball finds a bed pan – always bouncing to the open man, and always creating an open shot. On extra long possessions, when the ball zings across the court even more than usual, ricocheting around the 3 point line and finally finding it’s pre-destined home in the hands of a cutting big or a wide open wing, fans rise to their feet in anticipation, expecting the only inevitable conclusion that now surrounds almost every Hawks open shot – nylon. Cue pandemonium. Even more than the fans, the players really seem to be enjoying this. These guys prefer to give up their own shot for the sake on another’s better shot. They revel in the glory of a two-handed bounce pass that hits its intended target in perfect stride en route to a lay-up or dunk with the unfettered enthusiasm of a junior-higher just let out of school for the summer (especially on a 4th quarter “dagger 3” that puts a game out of reach). 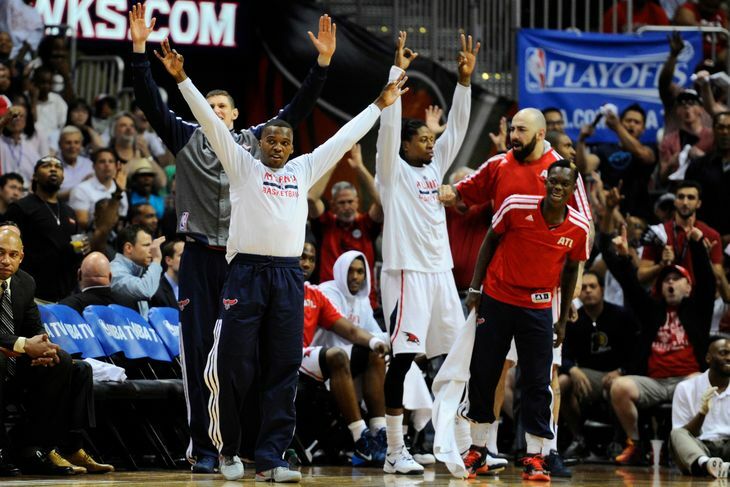 It’s special to watch the bench go bananas – great example here. They are cheering for each other, and playing not only with, but also for each other. They are sacrificing individual stats for the team’s greater glory. To an amateur theologian like myself, it sounds a bit like the “perichoresis” of the Trinity – the eternal indwelling and other-centered relationships between each person of the Truine God – Father, Son, and Spirit. This is the concept that early church leaders used to describe the inter-connected dance, the mysterious fellowship in the God-head. “That they all may be one; as thou, Father, art in me, and I in thee, that they also may be one in us” (John 17:21). St. Augustine described the Holy Spirit as the “bond of love” that proceeds from both the Father and the Son, the Lover and the Beloved. The Trinity is not only love but also community. Each is fully known by the Other. Each gives of himself fully for the Other. I suppose it would make sense, then, that a beautiful style of team basketball, one that displays unselfishness and oneness while celebrating the unique gifts of each player, would enthrall the sporting world. If the Trinity is indeed at the heart of all reality – a heart of mirth and joy and perfect love in community – it would make sense that it’s more fun to watch this kind of ball than the isolation heavy style of the 90’s. Even Michael Jordan, no matter how good he was at eternally backing down an opponent on the block, cannot compare to what’s going on with the Hawks. So let’s join the Trinitarian dance, Atlanta. If not by embracing and living out the love of the Trinity, than at least by rooting for the hometown team. That is a better version!